Electrical receptacles, also known as outlets and wall plugs, are convenient resources for tapping into the power of electricity. Electrical receptacles are simple in operation, so there is little to go wrong. This Fix-It Guide tells how an electrical receptacle works, what often goes wrong, how to identify an electrical receptacle problem, and what parts and tools you will need to fix it. It then gives step-by-step instructions for how to test an electrical receptacle and how to replace an electrical receptacle. Once you’ve tested and replaced everything else except the electrical receptacle, it’s time to consider receptacle repair. It’s a relatively easy task. How Does an Electrical Receptacle Work? This new receptacle has both terminal screws (sides) and wire slots (back). An electrical receptacle or outlet is a socket into which the wiring for portable lamps, appliances, and other electrical devices can be plugged. It provides the connection between a building’s electrical circuit and any corded appliance or other device that requires electricity to operate. Receptacles in older homes have two holes, hot and neutral, while newer homes add a third hole for a grounding connection for safety. Receptacle repair or replacement is an easy homeowner fix-it project. What Can Go Wrong with an Electrical Receptacle? Receptacles crack and develop shorts. They may not hold plugs in place securely. They can be the wrong color or paint splattered after you paint. Receptacles are inexpensive and easy to test and replace. It’s a good idea to invest in an electrical receptacle analyzer. Why? Because it’s cheaper than repairing the damage caused by a bad receptacle. For example, before plugging your expensive stereo or other device into an outlet in your new home, test it to make sure that it is properly wired and grounded. A combination of glowing lights will tell you what is happening with your receptacle. How Can I Identify an Electrical Receptacle Problem? If something you plug into a receptacle doesn’t work, first test that item in another receptacle. Make sure the power is on if the receptacle is controlled by a switch. If the receptacle still seems at fault, test it (see below) and replace it if faulty (see below). If you have an older home, invest in a circuit tracer. You can plug it into any electrical receptacle in your home and, with a companion tester, identify which circuit breaker or fuse in your electrical service box controls it. Then mark the box as appropriate. In an emergency you can quickly turn off a problem circuit without shutting down the whole system. What Do I Need for Electrical Receptacle Repair? What Are the Steps to Electrical Receptacle Repair? Turn off power to the circuit and verify that it actually is off before continuing. Insert one probe of a continuity tester into each slot of the receptacle. If the tester glows, the receptacle is working. Test both plugs of a duplex (two-plug) receptacle. If the receptacle fails the test, remove the cover plate, disconnect the screws holding the receptacle in the box, and pull the receptacle out. Restore power at the electrical service box. Carefully touch one probe of the continuity tester to a brass screw terminal and the other to a silver-colored terminal. The tester light will glow if power is coming to the receptacle. If the receptacle fails the test, check power across the hot and neutral (not the bare ground) wire coming into the wall box. If the tester glows, power is coming to the wires, but not through the receptacle. Replace the receptacle (see below). If necessary, strip the last 1/4 inch of insulation from the end of the wires. Shut off power to the box at the electrical service panel and confirm that the circuit is off using a circuit tester. Remove the cover plate and unscrew the mounting screws. Without touching wires or terminals, pull out the receptacle. Hold a new and identical receptacle near the old one to see how the wires should be installed on the replacement. Some use terminal screws on the side while others have slots on the back for inserting bare wires. Many replacement receptacles have both. Unscrew the terminals and carefully pull away the wires. 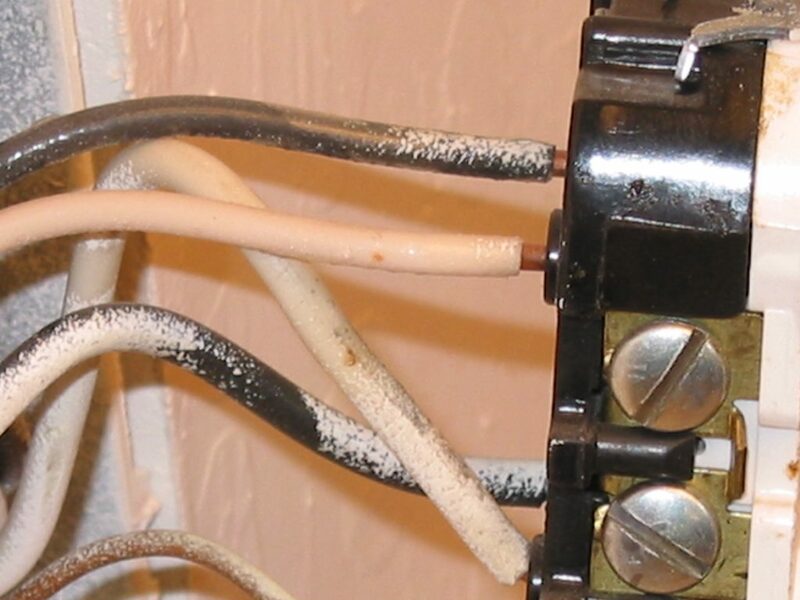 Make sure the wire ends are clean and free from insulation. 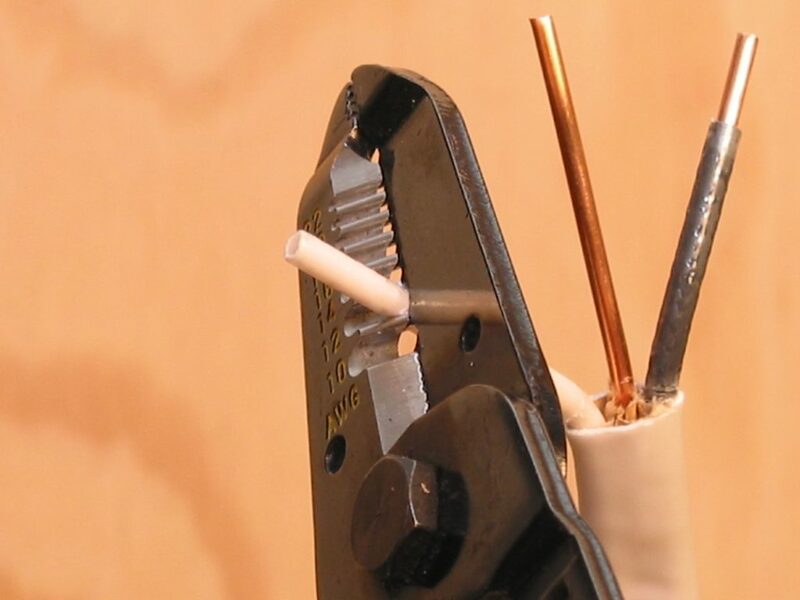 If needed, use a wire stripper to remove insulation from the last 1/4 inch of the wire. Make sure all wires are correctly installed before inserting the new receptacle into the box. Attach each wire to the new receptacle in the same way it was attached to the old receptacle. The white wire typically is connected to a silver terminal and the black or color wire is connected to a brass terminal. Use electrical tape as needed to cover all terminals and bare wires. Gently push the outlet into the box. Tighten the mounting screws, and check that the receptacle is straight.